Today was the first time we got back on a rope since January or February, so we took it pretty easy. We went to Dead Cats at Reimer's Ranch and climbed several of the routes we're really comfortable with. It's been really hard to climb outside here in Austin with the weather this year, so we've mostly been training in the gym. Unfortunately, neither gym climbing nor limestone really prepare your fingers for the rock at Hueco Tanks! It's hard to take sport climbing photos when there are just two of you, so we don't have anything to share in that regard. But Beth did find a nice place to do a little bit of yoga afterward, with quite an amazing view! 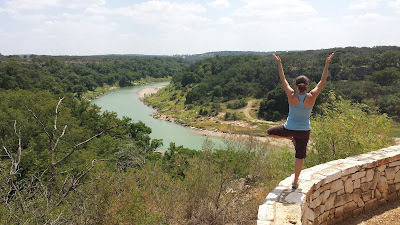 Beth doing Tree Pose while looking out at the Pedernales River. Yesterday I got to go to Rogers Park with Austin and Nicole. We hit a few of the easier problems, and then Austin flew up Dugout like it was nothing. Rogers is full of awesome overhanging limestone walls, but it is a couple hours outside of the city. Me flashing Abash. Thanks for snapping a shot Austin! Austin flying up Reach, though his topout looked pretty awkward.